Personal doubt. Naysayers. Procrastination. These are things that keep us from reaching our goals and completing dream projects. 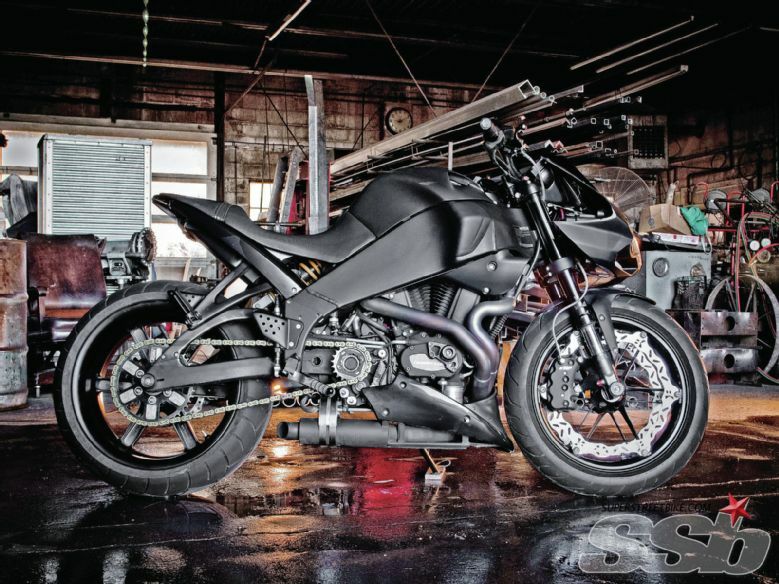 Adam Taylor ignored those things, picked up the tools and created a 2010 Buell XB12SCG Lightning unlike anything we’ve ever seen. “I fell in love with motorcycles in high school at age 15 and saved my pennies until I bought my first bike, a Suzuki Intruder 1500 cruiser, but I eventually sold it to build my first custom sportbike when I was 17 years old,” Taylor said. 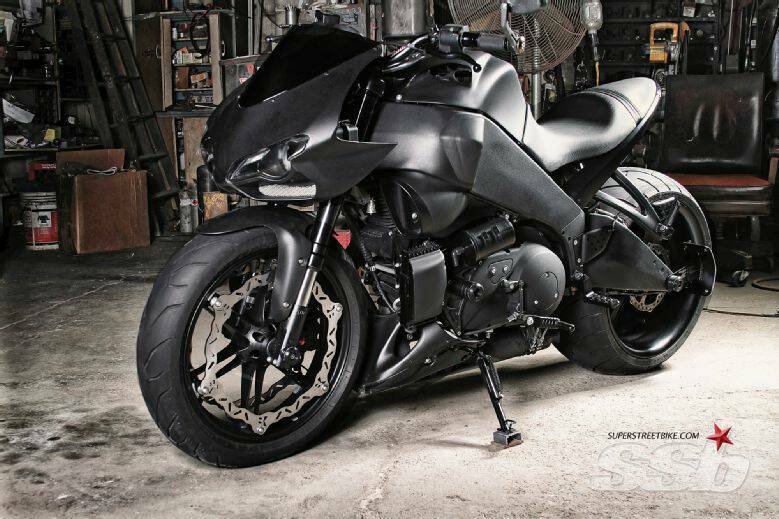 “I didn’t come from a family of riders or fabricators, I just wanted to build a sportbike the way I wanted it, and with enough time and effort, I figured out how,” he added. Taylor’s first crack at a custom sportbike wasn’t a taped-together Honda Hurricane built with zip-ties and Gorilla glue either. “I took a used TLR motor and frame and built everything from there. I loved the Ducati 916 so I modified the frame to accept the single-sided Ducati swingarm and added other parts like Marchesini rims, Sharkskinz bodywork and I even hand painted everything in my garage,” he said. The one-off monster was a teenage work of art. His second project was a proper streetfighter anchored around a good ol’ American V-twin motor. “I wanted to build an American Muscle bike with a big V-twin engine and a custom frame, but that was going to take too long, so I used an already well-equipped American-made chassis and motor, the Buell XB series,” Taylor said. After commuting on a 2005 XB12R, Taylor was convinced it was the perfect canvas for a custom build. However, instead of the clip-on equipped R-model, he opted for the upright-bar equipped XB12SCG for its lower stance and open-cockpit design. “I bought a 2010 model with the more sophisticated fuel injection and other upgraded stock parts, it was the best XB ever made,” Taylor said. Unlike most builds that slowly take shape over time, Taylor purchased half of the parts long before even owning the bike. “I had a vision stuck in my mind of a black Buell with a stock wheelbase, wide tires, low stance and a Ducati front fairing–I was determined to make it happen,” Taylor said. “There were 240 kits available, but I wanted to try and tuck a 300 on a stock 52-inch wheelbase,” he explained. Taylor started with an early-model 2005 swingarm since they offer more width than the later unit on his 2010 model. After lots of measuring, he split open the ’arm and widened it 1.5 inches. While he was in there he also expanded the oil tank (Buell’s carry oil in the swingarm), upping the capacity from a stock 2.8 quarts to 4.5. “I eventually settled on a 280 rear tire since a 300 wasn’t going to fit with the stock 52-inch wheelbase and I was unwilling to stretch it,” Taylor said. “So I sent the rear wheel off to Kosman Specialties where it was widened to 10.25 inches, while still retaining the stock, rolled lips that give it a clean finish,” he added. Pulley changes on the factory belt-drive system aren’t easy, so Taylor had no qualms swapping to a chain setup, especially since it helped with the widened rear wheel. “I was happy with the chain conversion since it allowed for easy gearing swaps and looked even more mechanical than the stock belt–the front sprocket is a custom setup that moves the chain outward and inline with the wider rear wheel,” Taylor added. But that’s not the only part of the rear wheel that received a custom treatment. The stock two-pot rear caliper was swapped for a four-piston Brembo unit along with an Erik Buell Racing Tri-Prong rear race rotor. The pair were hung from a custom mount inboard of the factory location. Since Buells are known to chew through the stock wheel bearings, Taylor had GrandStand Designs make a custom two-piece hub that bolts to the stock wheel. The beefy setup uses massive automotive bearings that are overkill at best, but will never wear out. The leading hoop was sent to Cycle One-off where it received a redesign. Unlike stock Buells that rock just one perimeter brake rotor and a single eight-piston caliper, this bike sports a pair of perimeter rotors and will soon have another caliper. “The dual front brake setup is subtle, since only Buell fans recognize the significance of the new combo, but that’s how I like things, ordinary to all but the most trained eyes,” Taylor said. That being said, did you catch the 150/50-17 tire that Taylor also managed to squeeze onto the front rim? “The wide front tire was a small trick that barely worked (it clears the fender and forks by a couple millimeters) for that wide, low and muscular look,” Taylor said. With such an aggressive rear end coming together, no off-the-shelf tail section would do. Instead he took to creating a custom design all his own. “I hacked the stock unit apart and had a few pieces welded together,” Taylor said. “I then had a custom integrated LED taillight made by Radiantz that not only looks great, but is also bright enough to be functional,” he added. If the aft part of the Buell doesn’t steal the show then the Ducati 1198 front fairing grafted to the leading edge of the stubby streetfigther certainly does. “The Ducati fairing was a must since it’s one of the best looking fairings ever made, but it took a lot of modification to mount it, as I shaved down over 1/3 of the material to get the fitment right, including trimming down the windscreen and the overall height,” Taylor said. While in the trimming mood he also modified the Showyo Moto ram air airbox lid with functional ram-air ducts to feed the 1203cc beast beneath. A K&N air filter and a powdercoated D&D slip-on were also added to pump up the power. TunerPro software was used to make a custom fuel map using nothing more than the data-logging portions of the program, a laptop and the factory oxygen sensors. The later Buells came with an ECU that could tweak the engine down to individual cylinders, something that’s crucial on an air-cooled V-twin where the back cylinder always runs hotter due to less air contacting the cooling fins. “I’d always wanted an air-cooled American V-twin since they lope, shake and vibrate like a beast–they’re beyond badass and have tons of character, unlike the glass-smooth Japanese sportbikes,” Taylor said. I didn’t come from a family of riders or fabricators, I just wanted to build a sportbike… and with enough time and effort, I figured out how.